Trixis is a member of the Sunflower Family. The plant appears as a sprawling shrub growing to 3.5 feet in height with dark green, lance shaped leaves which have smooth or finely toothed edges that grow to 2 inches in length. 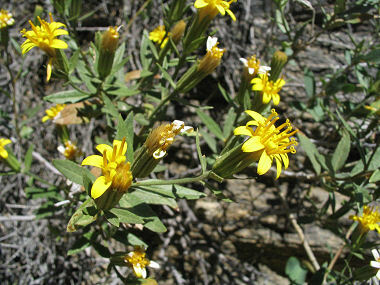 The plant typically grows on rocky slopes, along washes and among other bushes at elevations below 5000 feet. Trixis is also known as American Threefold. Trixis blooms between February - October and produces bright yellow, rayless flowers that are surrounded by leafy bracts to 0.75 inches in width.